Why does the National Trust for Scotland have a curator dedicated to working with our photography collections? Prosaically, historic photographs can show us what our places used to look like. A good example of this is Inverewe House at Inverewe Garden. The first house was built in the 1860s but, in 1914, was gutted by fire. In the 1930s the ruins were pulled down and replaced with the house you see today. Without photographs, there would hardly be a sign of the old house at all, as the only remnants now lie in the rock garden. Historic photos help us paint the whole story of our places, and not just snapshots. This refers to people, as well as time. At Pollok House in Glasgow, the servants’ quarters recently went through a period of being closed to the public. 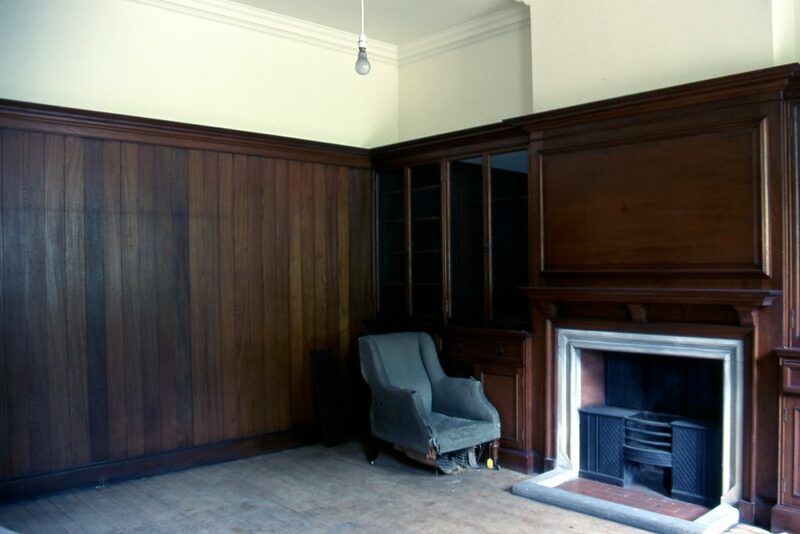 Record photos contrast the bare walls as they were then with the newly displayed space as it is now. In the past, it has been too easy to focus on the upstairs stories of grand houses and stately homes, forgetting or ignoring the hard work of the servants, who toiled to make apparently effortless lives of luxury possible. With TV shows like Downton Abbey, and a concurrent revision in the way we look at history, it is slowly being realised that we must tell more diverse stories of our places. The queer, black, female and working class strands of our stories have too often been omitted in favour of the straight, white, male strands. Our photographs help illustrate how we are redressing the balance, by bringing life to stories that have lain neglected. There is another key reason we focus on our photographic collections. They are memories made flesh, tangible evidence of belonging and a proof of life. Photographs are created because light has bounced off a physical object and imprinted itself on to paper, imprinting that object, place, person or moment onto something we can carry with us. We invest ourselves in their meaning because they are the life that is left behind. 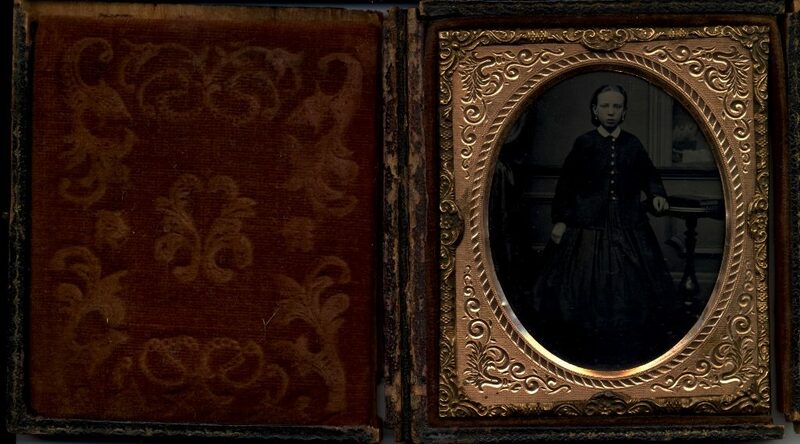 Alone, or particularly in a photo album, photographs are objects we can continue to hold conversations with, objects that help us tell stories and that keep those stories alive. A photograph both captures and extends the moment – it is why people save and cherish photographs. It is why our photographic archives should be dusted off and researched. They hold secrets to the way we see our past and the way we see ourselves. They are keys to human stories, and human stories are key to our places. Photographs do not just show us how our places have changed, they breathe life back into them today. If it is people, and the stories of these people, that make photos so important, then by extension we should look at families too. Homes like those in our collection were often lived in by families, and by telling their stories through photographs we can put those families back into their homes, and let our visitors engage them in conversation. 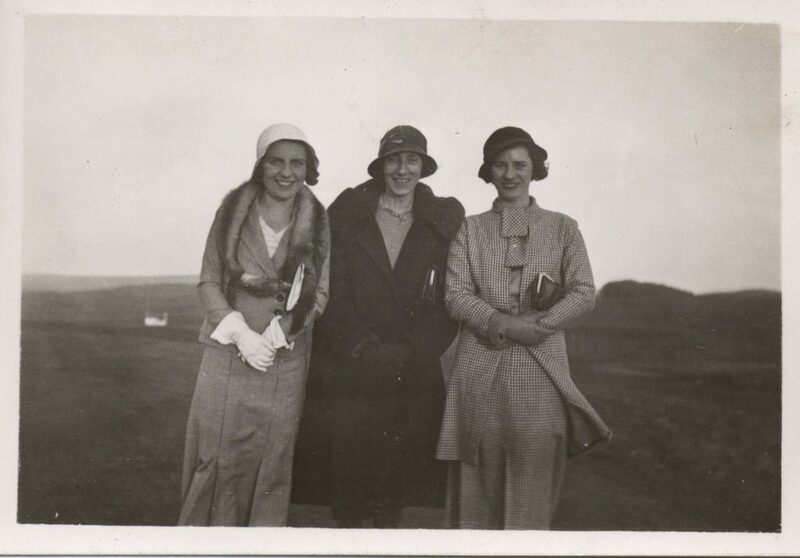 Compiling photo albums was a popular activity for upper class women such as Violet May Hope. It was considered a suitable pastime for them, and possibly helped replace the tradition of the lady of the house reading the Bible to her family in the evenings. Violet started her albums in a format that I think many of us would understand today – the autograph book. Today, we use social media to document social interactions and keep track of friends and family, and it was common in the late nineteenth and early twentieth centuries to do something similar. At the houses Violet visited during the year, she collected autographs from those who were present, along with their photographs and a photo of the house she was visiting. 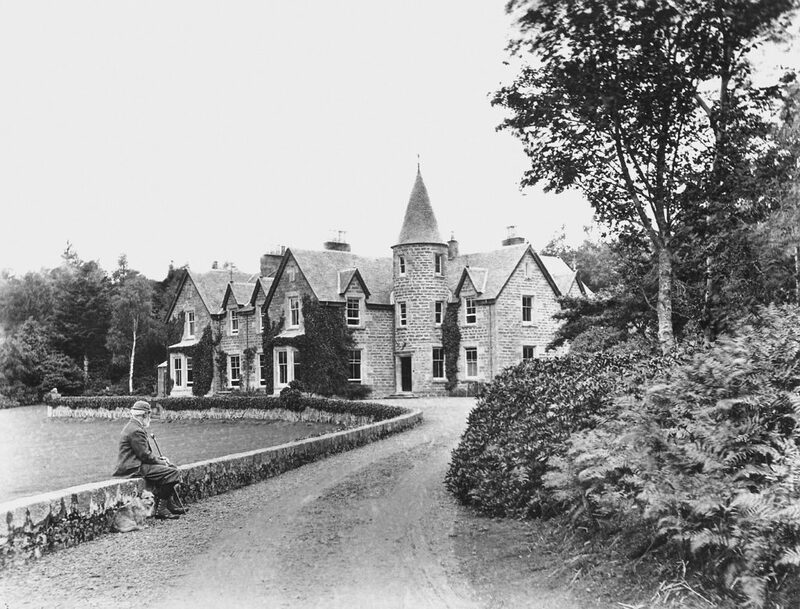 In 1904, Violet married Ian Brodie, 24th Brodie of Brodie Castle, Aberdeenshire, somewhere she had visited regularly throughout the first years of the twentieth century. Marriage did not stop Violet taking photos, but their nature changes, and she filled several albums with happy family snaps, particularly of her first child David (nicknamed ‘Kuropatkin’ after a Russian politician). In due course, David was joined by a second child, Michael (Peter the Great), who he holds tightly onto, looking after him, guarding him. But it is not Michael who needs guarding. 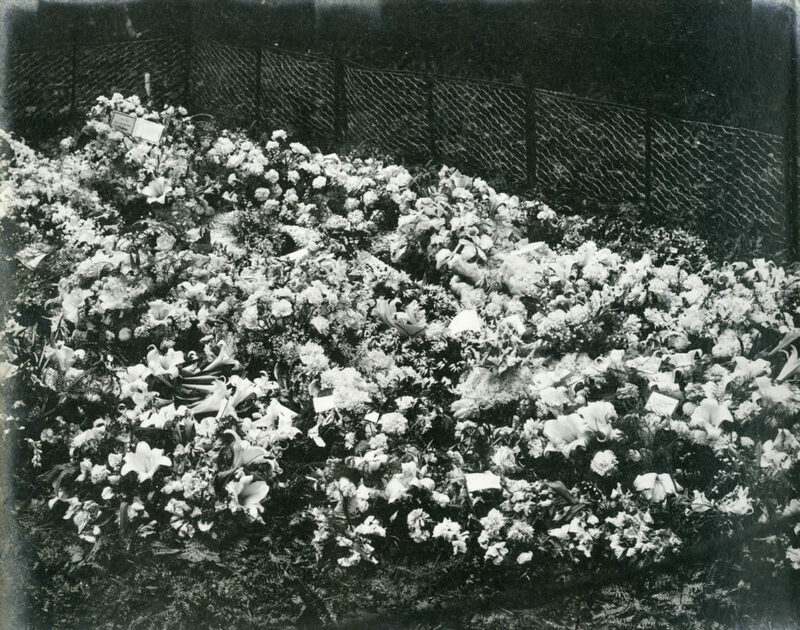 Half way through one album, there is a single large photo captioned: Flowers on the little grave, 1911, then nothing else in the rest of that album, just blank pages. 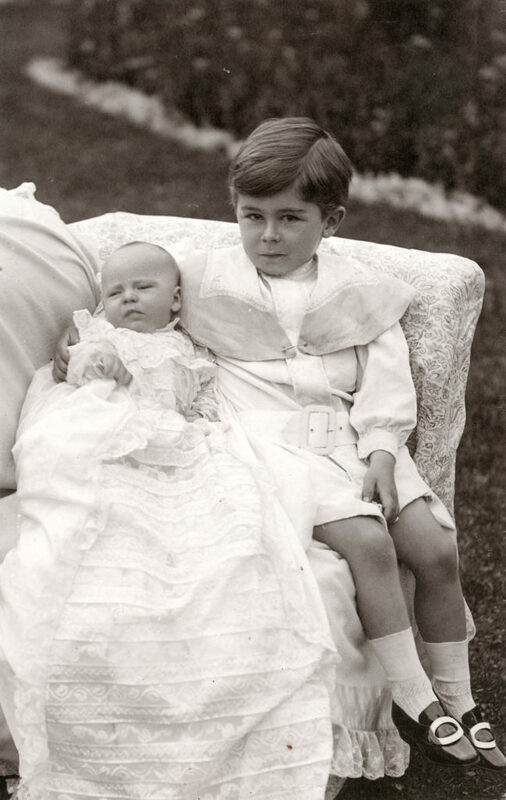 The next one in the set starts with photos of Michael dated 1912, but he doesn’t have his brother there to look after him anymore. David is gone, that single photograph and those blank pages a mother’s testament to a life cut short. The power of photographs is strong enough to conjure this sad family story with hardly any words at all. In Brodick Castle on Arran are more photographs that demonstrate the importance and value of family. These casual shots are of the sort that many of us would take ourselves; indeed, visit the beaches on Arran or the amphitheatre at Italica in Spain, and you could still take almost identical photos today. They were taken by Lady Mary Douglas-Hamilton. 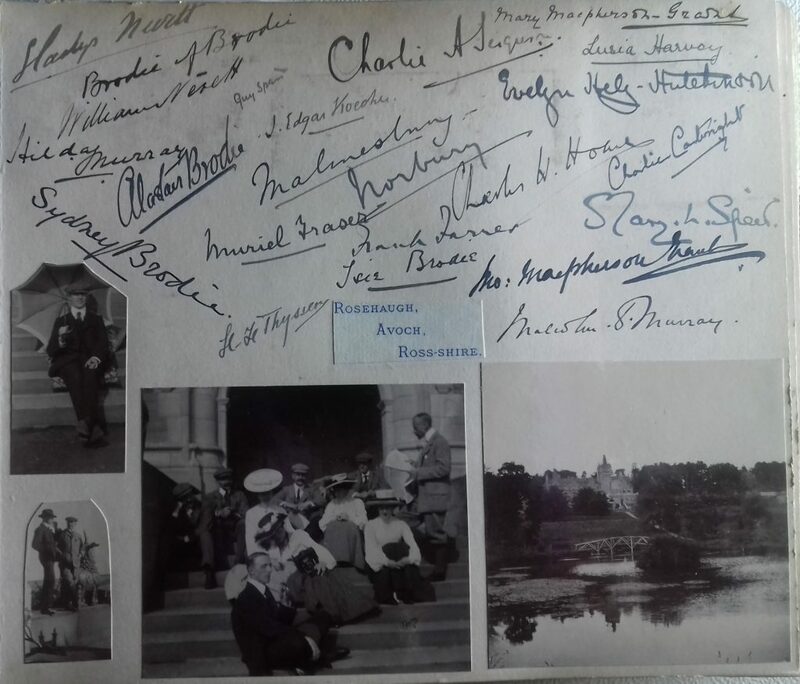 Most of them date from 1912-1913 and document golden summers travelling in Europe, hunting on Arran and playing cricket at their English home of Easton Park in Suffolk. Lady Mary clearly takes great delight in snapping her children playing at (and learning to be) grown-up, and her husband James Graham, later 6th Duke of Montrose, playing at being a school-boy again. 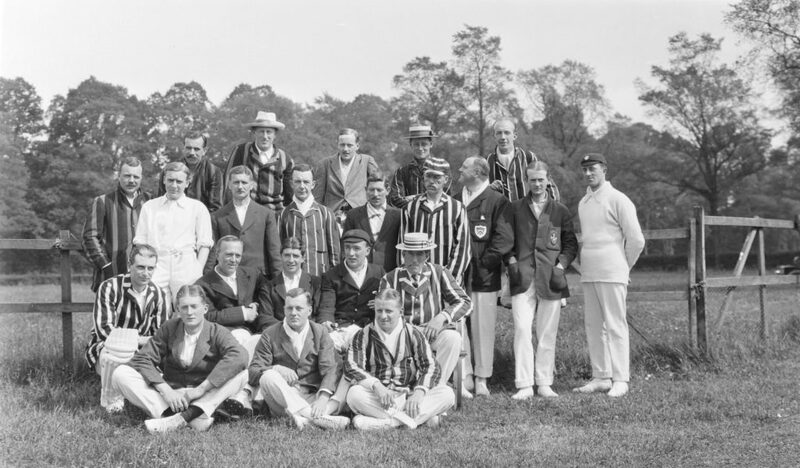 Graham (at the back of the above photo wearing the white hat) formed the Easton Ramblers cricket club, who played his old school, Eton, as well as regimental and local teams. To us, these photographs have a nostalgic tinge, which illustrates a potential pitfall when viewing historic photos. We are quick to place our own emotions on to them – here influenced by the knowledge World War One was just around the corner for these young men. For people at the time, these photos would not have been nostalgic symbols of a bygone age, but shots of friends and family with names and personal associations. In this way, like Violet Hope’s photographs, Lady Mary’s family snaps can tell us something a little deeper, and a little sadder. In this photo, gone are the children taking their first steps to being grown-up and the carefree youths idling away their summers with a spot of cricket. In their place are wounded and bandaged veterans, motherly nurses, a definitively martial tone. Many of the cricket teams playing at Easton were from regiments billeted near-by. 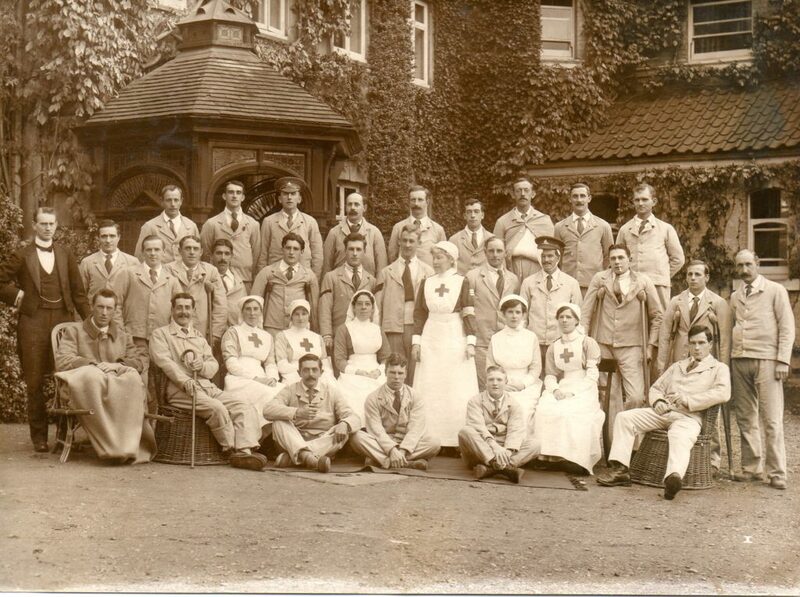 Who knows if any of the men who had visited Easton Park in their cricket whites returned in blood-stained khaki. On a different part of the social spectrum we have Miss Agnes Toward, a typist born in 1886 who spent most of her life in what is now The Tenement House. Her life could hardly have been more different from those of Violet Hope or Lady Mary. However, all three women took and valued photographs. In this way, photography can link people from all walks of life, as well as the then, and the now. The Tenement House photographic collection contains everyday images from the 1840s to the 1950s. It provides the life that still energises Miss Toward’s home, and illustrates the growing influence photography has had on people’s lives though history. Miss Toward’s collection starts with a daguerreotype of her mother as a child. It is the only one Agnes owned and dates from the late 1840s. Glasgow had the first daguerreotype studio in Scotland – started by a H W Treffry in 1842. It would have been expensive – a jewel like image imprinted on metal encased in a leather box lined in velvet. Agnes’ mother looks stiff and clasps the table beside her. She was probably nervous at the new contraption in front of her, but it was also practical to hold onto something to keep steady – shutters on early cameras could be open for as long as 15 minutes. Photography was the first affordable method of obtaining your likeness, and became very popular with a new class of workers who had the rare commodities of spare time and surplus income. By the mid-1850s, technology and chemistry had made the process of photography much quicker and cheaper. One of the most important inventions was the carte de visite, which first appeared on Scottish high streets in 1854. Cartes de visite were generally 2.5″ x 4″, and special lenses were developed so eight images could be captured on a single 8″ x 10″ glass plate. This meant one snap produced 8 prints, allowing photos to be bought and sold for mere shillings. 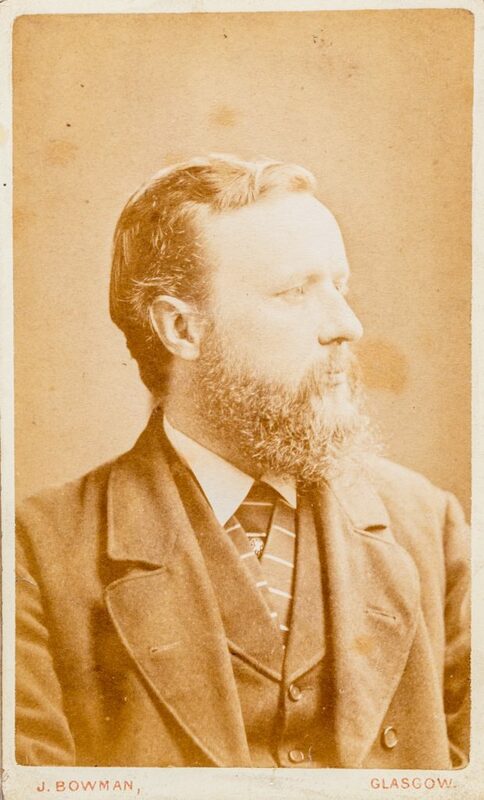 However, this did not make photographs any less precious, Miss Toward’s father died when she was a child and a carte de visite is one of the only photographs she had of him. This ability to image oneself as a participant in the public sphere significantly increased in the late 1880s when the new hand-held Kodak camera came onto the market. It changed the face of photography again, making it more about capturing motion and action and taking informal ‘snaps’. Photography had always been a female pursuit as there was little history binding it to a masculine canon. The first advertising actively catered to the female consumer and families, and themes of action, family life and femininity in photography continued into the 1930s. By the 1950s, snaps in Miss Toward’s collection show the fashions of the day and capture the blustery camaraderie of work colleagues. This all demonstrates how an apparently unremarkable collection of photographs can be used in multiple ways. It can trace the history of photography and its impact on peoples’ lives over time; and can bring life back to a place that has not been lived in for more than fifty years. From family, we move onto people who were treated as family, at least in the context of photography. At Brodie Castle is a whole album dedicated to the servants of Elizabeth Gordon, Duchess of Gordon. She married the 5th Duke of Gordon as Elizabeth Brodie in 1827, but was widowed just nine years later. Over the next thirty years of her life her servants became, in her own words, her family, so she accorded them the same privilege of family, and created a whole affectionate album immortalising them. While working class figures had appeared in early photography, they were usually to represent ‘types’ of people, or to be held up as examples, usually bad ones. A tender, heart-felt album like this, with every servant dressed in their best on the special occasion of being photographed, is a very different approach. 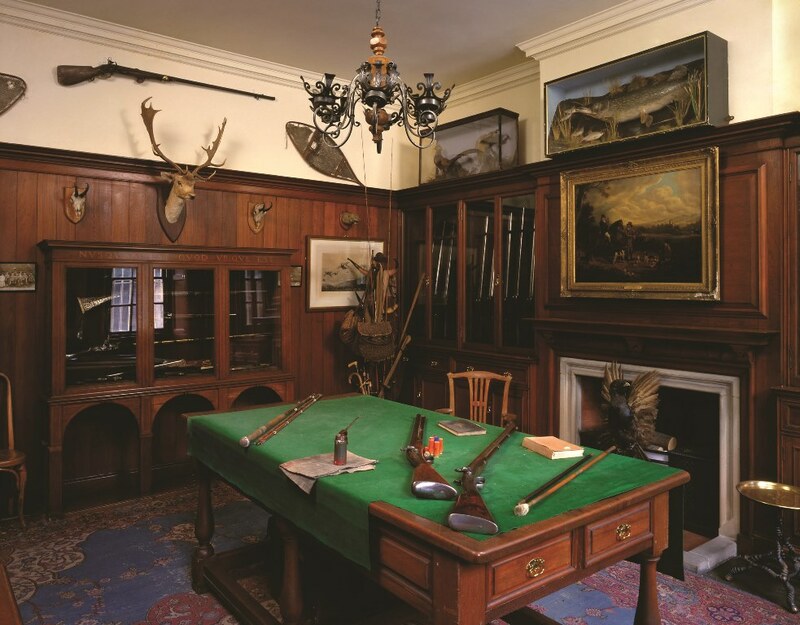 As with the Gun Room at Pollok House, finding and exploring an album like this lets us tell better balanced stories of our places by putting everyone back into them, not just the rich and privileged. These people are still being defined by their status as servants, but to the Duchess of Gordon they were more than that. They were family, and family deserves to be photographed. For Margaret Fay Shaw, the people of the Isle of South Uist were family, although they too were not blood relations. Margaret was an American of Scottish descent, who first went to live in the Hebrides in 1929. 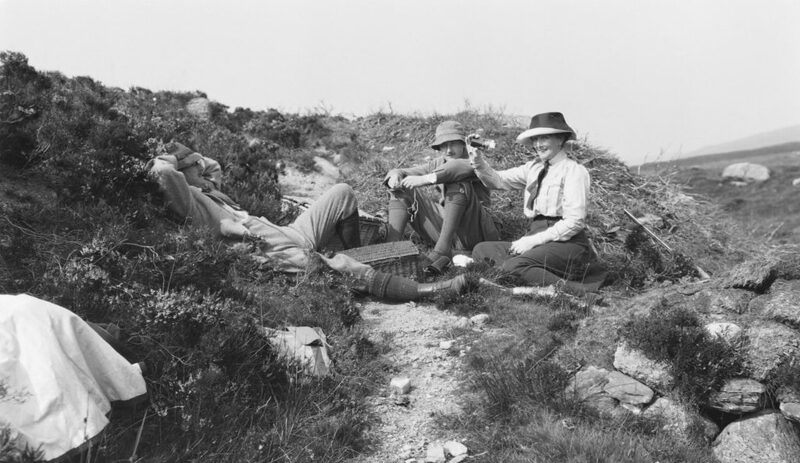 She was so taken with the people and the place, that she spent almost the whole rest of her long life there, first on South Uist, and later on Barra and Canna with her husband, the folklorist John Lorne Campbell. Margaret created over 6,000 images of the Hebrides (and elsewhere), which are now kept on Canna in Canna House. Her photographs are not art photographs in the mould of so many famous photographers of the Hebrides, although plenty of them are very artistic. They were expressly not taken for anthropological reasons, although they are of vital anthropological importance. They are essentially family photos, immortalising the people who took her in and showed her such kindness. 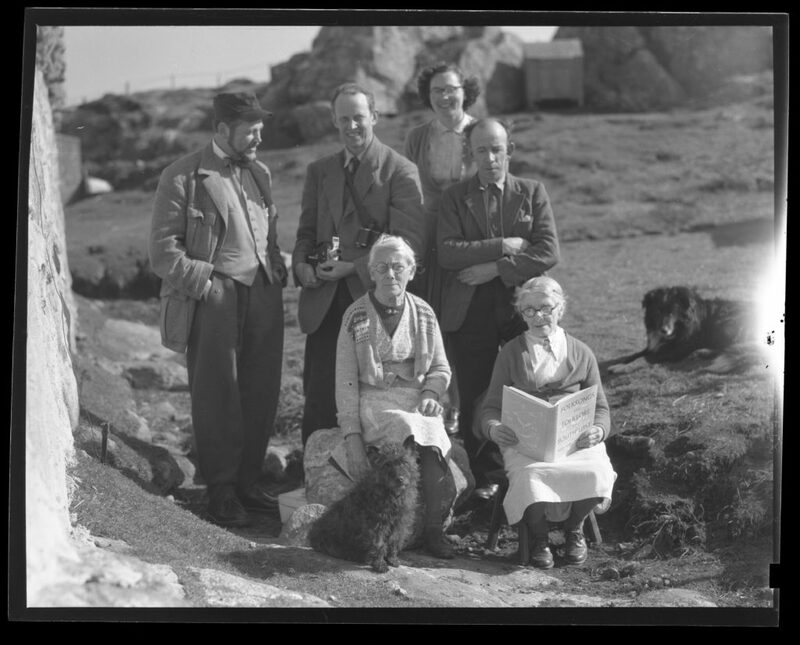 Margaret’s book Folksongs and Folklore of South Uist, illustrated by her photographs, did much to help preserve Gaelic folklore for the future. It was not to say ‘this is past’ – but to allow real moments to remain ongoing, and to preserve them for the future. One of her friends on South Uist said of her, ‘an ember was dying; she blew on it and brought it back to life’. We are trying to do much the same with the photographs in our collection, to use them to keep the embers of the past alight. To better preserve, understand and use Margaret’s archive, we are currently digitising and documenting it. The goal is to match names, places and stories to these photographs, and to ensure the life they represent stays alive with meaning, so it is not seen as a ‘vanished life’. This in turn will keep Canna House, and the stories it contains, alive for future generations. From Canna, we head even further west, to an island where the attitudes exposed by photography could not be more different. St Kilda’s visual image was built of stereotypes, created, sustained and now better understood by photographs like those in our collection. The last 36 St Kildans were evacuated in 1930 as their population dwindled due to shortages of food, building supplies and clothing. 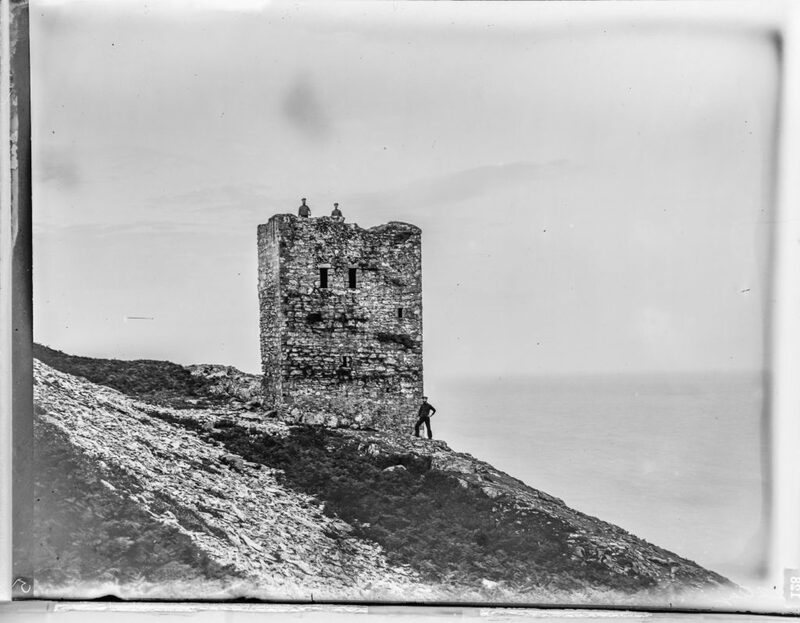 Despite this harsh reality, the island is still defined by the photographs that captured it in the 1880s, when it was already falling apart. These images romanticised life on the remote islands, and viewed the people there with a superior outsider’s viewpoint, rather than a sympathetic, family eye. St Kilda was first photographed for commercial purposes by Aberdonian commercial photographer George Washington Wilson in the 1880s. 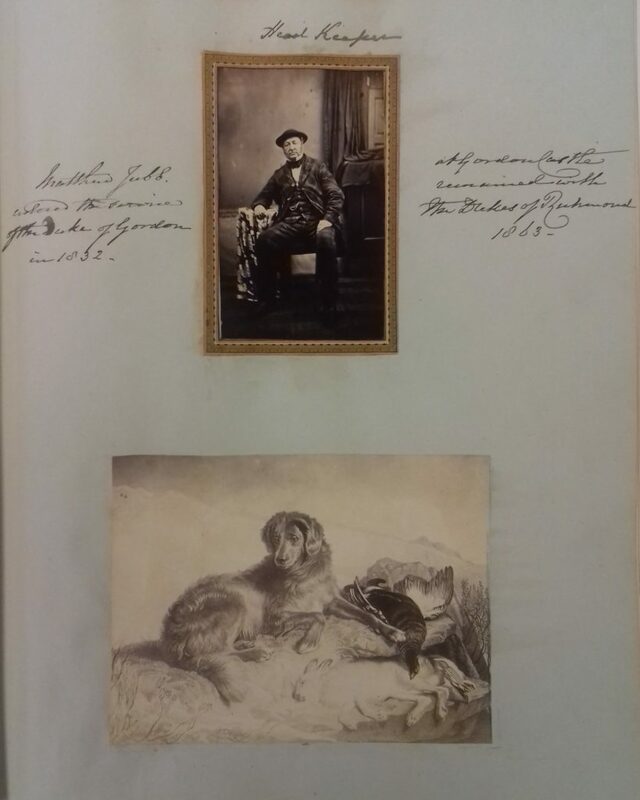 His photos catered to the Victorian craze for the sublime, a craze fed by the Romantic poetry of Wordsworth, Byron and Burns, along with the wild paintings of William Turner. St Kilda was a sublime illustration of what it meant literally and metaphorically to be on the edge of the world. Within this landscape, people were merely props, there to feed the perceptions of outsiders. The photographs of St Kilda are often hazy views blending photographic ‘fact’ with artistic ‘fiction’. The photograph was a marvel for most Victorians, as it allowed people to study nature up close in the comfort of their own homes. 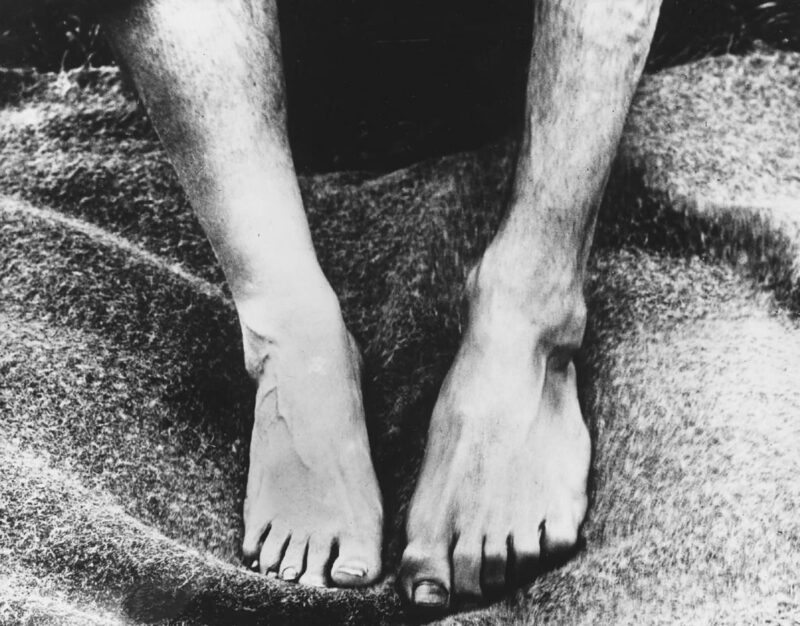 For most, there was an overwhelming tendency to believe photographs were nothing but factual, so that images like the one below (illustrating the different shaped feet of the islanders) were seen as absolute proof of difference. Context is important here; in 1859 Charles Darwin had published On the Origin of Species which set out the concept of evolutionary biology and the idea of a hierarchy of development. These photos starkly set St Kildans against the mainlander, placing them closer to the ancestral ape than modern man. 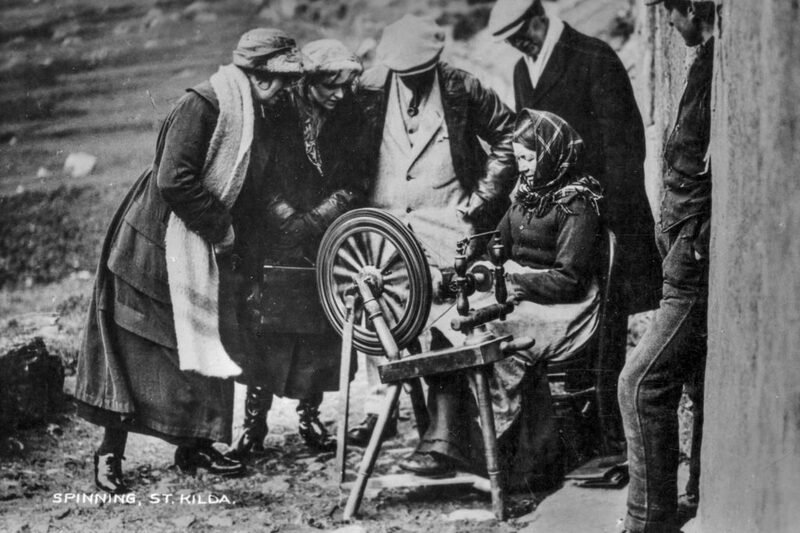 The people of St Kilda were therefore placed outside of the embrace of family that we have seen through the previous photographic collections, becoming stereotypes and symbols rather than people. Symbols also play an important role in the collection of about 300 glass plate negatives at Culzean Castle on loan to the National Trust for Scotland from the current Marquess of Ailsa. 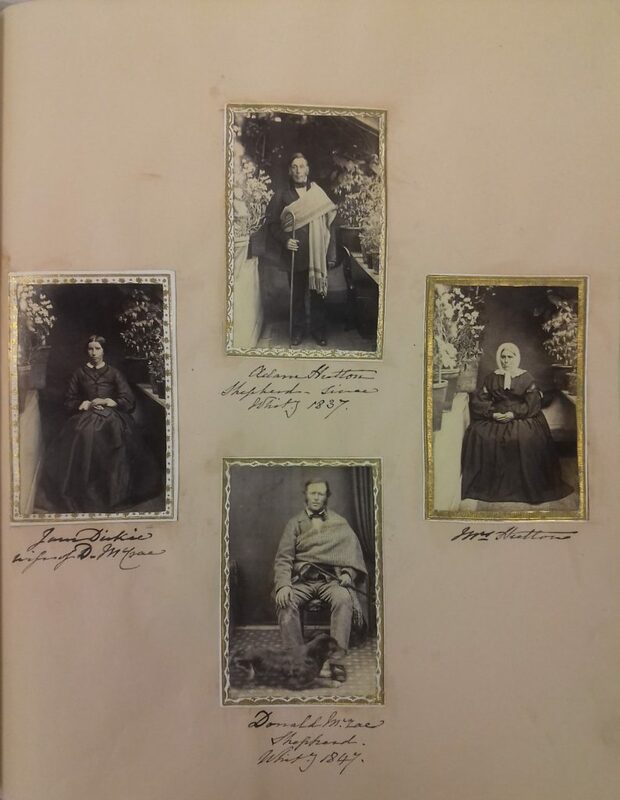 One of his ancestors, 3rd Marquess Archibald Kennedy, took these photographs at home in Scotland and further afield at the end of the nineteenth century. The 3rd Marquess was a forward-thinking man, interested in steam engines, motor cars and the railway. 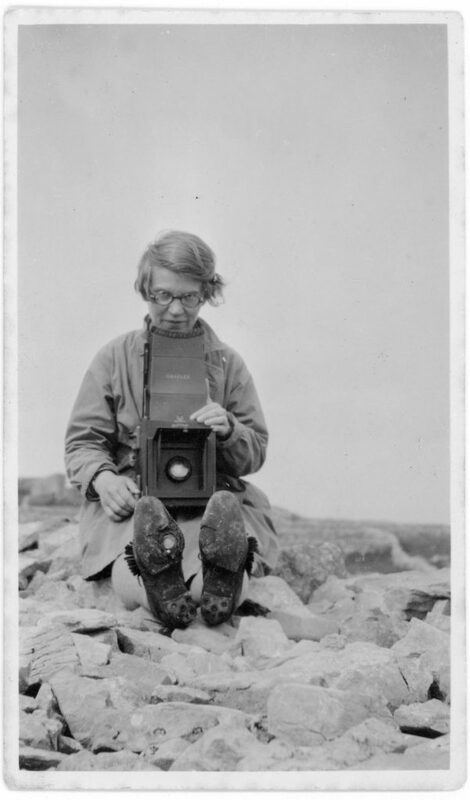 He focused much more on places and things than people, in contrast to the family snaps in the previous collections. This is reflective of the different spheres men and women operated in at the end of the nineteenth century, and the different interests it was deemed acceptable for them to have. Women were supposed to be family oriented, while men were supposed to be worldly and acquisitive. In the collection are also dozens of photographs of ruined castles and wild landscapes, haunted looking abbeys and brooding towers surmounted by intrepid explorers. In these we can see similar picturesque themes to those in the St Kilda photographs. The long history of written and painterly Picturesque and Romantic imagery meant that amateur (and commercial) photographers also took them up as aesthetic models. 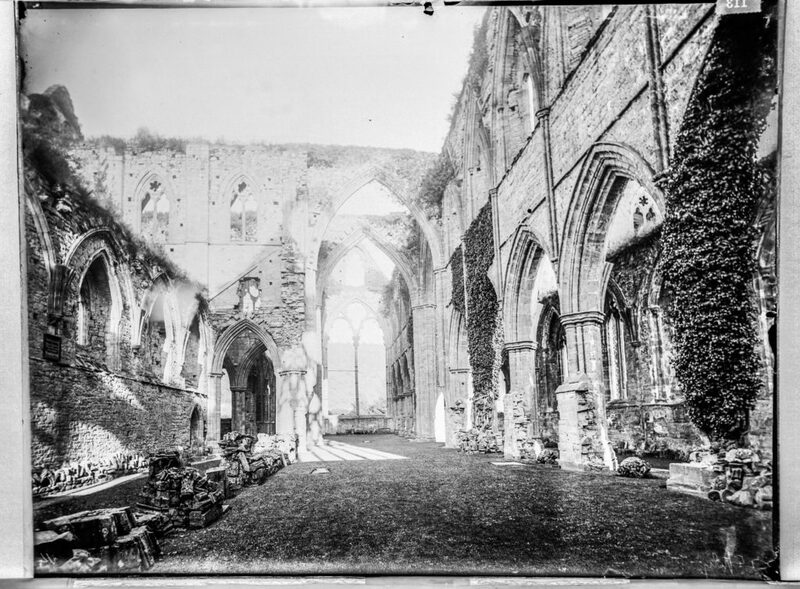 A photograph of Tintern Abbey taken by the 3rd Marquess is a good case in point, the abbey featuring as it does in Romantic works by both Turner and Wordsworth. He seems particularly interested, however, in the ruins of his ancestral homes. This is perhaps not particularly surprising, but might there be a deeper motive for his interest beyond simple family ties? Not only was he recreating the Picturesque ideal, but he seems also to have been seeking to capture and preserve the memory of his family. Their castles may have been crumbling, but there was one easy way he could save and protect them for future generations – photography. The castles become symbols of his family’s past, and through photography the 3rd Marquess tied this past to his present, and we can further use them to tie his present, to us. This is key to understanding why we are currently choosing to focus on our photographic collections. Photographs and photograph albums like the ones discussed here are like suspended conversations.1 They gain meaning when they are picked up, pored over and discussed, in the same way that those who took the photos and compiled the albums would have done. By researching, redisplaying and reinterpreting our photographs, and by encouraging engagement with them in as many ways as possible, we try to pick up those conversations, to act as a mediator between the photographs and their takers then, and our visitors now and breathe life back into our places. 1 For a more in depth discussion of this idea, see Suspended Conversations: The Afterlife of Memory in Photographic Albums, Martha Langford, McGill-Queen’s University Press, 2008. More images from the Inverewe House & Garden photographic collection. 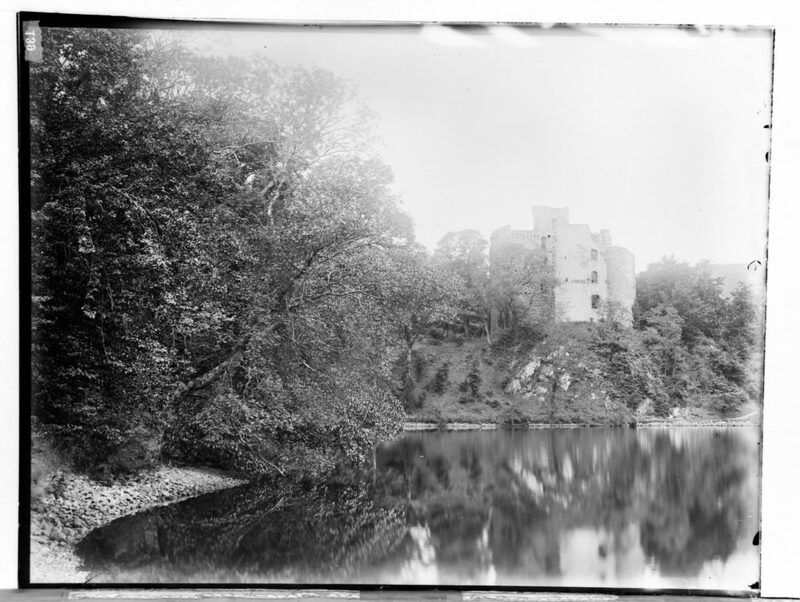 Learn more about the Pollok House photographic collection. 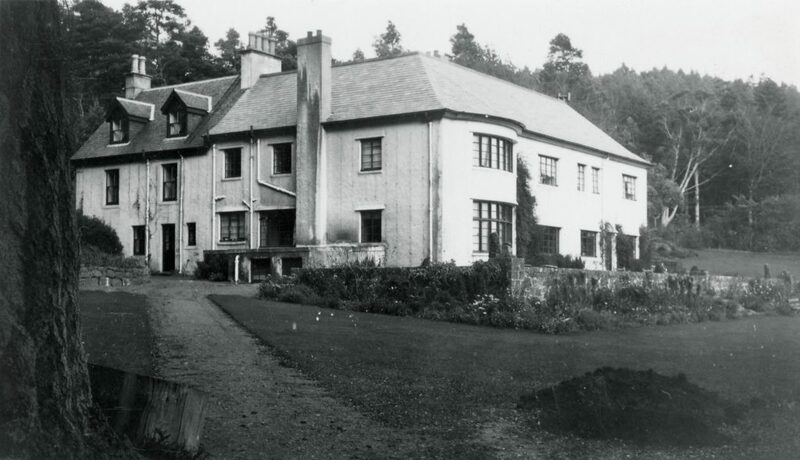 See more of the Brodick Castle photographic collection. An introduction to the Morton Project’s work with the Canna photographic collection. 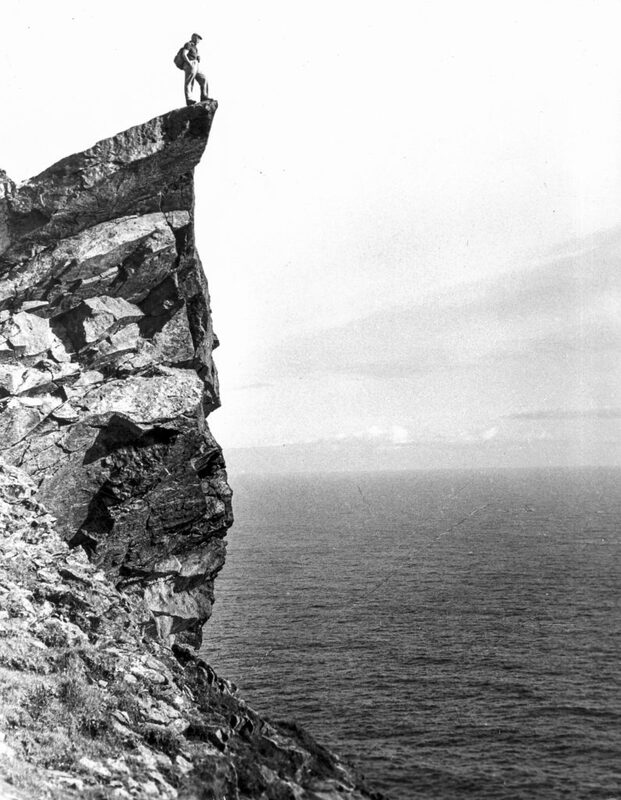 Read the first in a series on the St Kilda photographic collection.